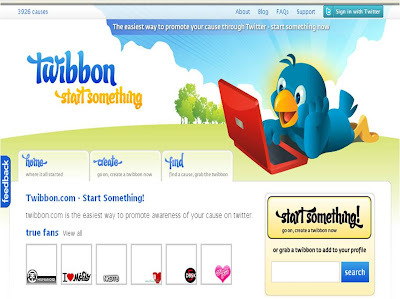 Twibbon (http://twibbon.com) describes itself as 'the easiest way to promote your cause through Twitter. Twibbon's are created through '3 easy steps and soon all your supporters will be proudly wearing their twibbons on their twitter profile images. Simply describe your cause and upload a twibbon image and we will do the rest.' 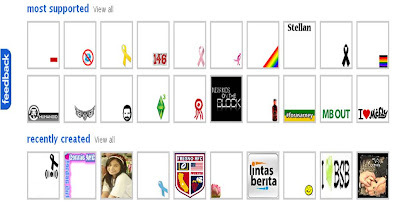 Alternatively Twibbon users can Search for an existing cause and click on the thumbnail to affiliate themselves to it. Twibbon launched two weeks ago and as of this morning, Twibbon has generated 101,836 pledges of support(!) shared among over 3,874 varied causes. Twibbon usage has increased rapidly in its first 14 days. As the Twitter user base widens (and Twitter users look for ever more imaginative ways to use Twitter) then Twibbon usage should continue to grow - watch this space!